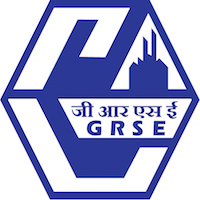 GRSE Recruitment 2019 – Garden Reach Shipbuilders & Engineers Ltd. (GRSE) notification announced for Supervisors in various disciplines. The detailed eligibility and application process are given below. 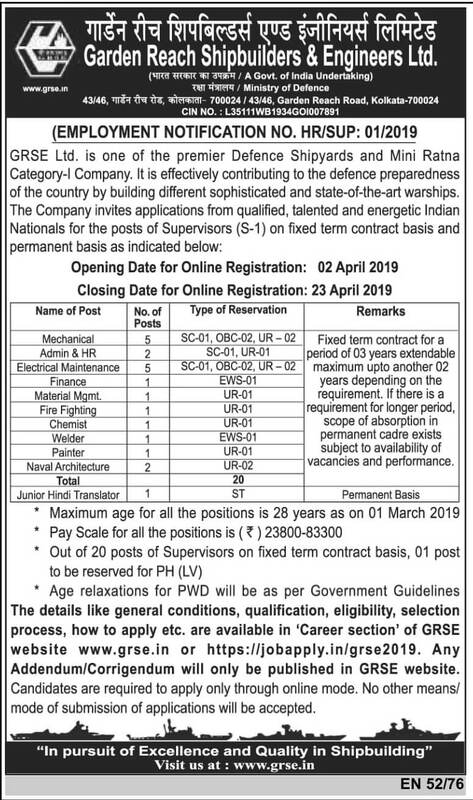 For More Educational details of Supervisor posts, Selection process & application process are uploaded on GRSE website (www.grse.in) from 2 April 2019 onwards. compulsory or optional from recognized University or Institute. Age limit (As on 01.03.2019): Below 28 years (Relaxation as per government policy). The mode of selection will be based on Written Test/Practical Test. Based on the performance in the Written Test and merit, in case of Supervisors (Jr. Hindi Translator) the candidates will be called for practical test on Hindi typing and translation of Hindi to English and vice versa, which will be qualifying nature only. Duration of Written Test – 02 Hours. Question paper language – Bilingual (English & Hindi). Question paper type – Objective type with Multiple Choice Questions. Examination Centre: Kolkata and Ranchi. How to apply for GRSE Recruitment 2019? All interested and eligible candidates apply for this position in online from 2 April 2019 to 23 April 2019. After submitting successfully, send a print out application form along with required documents to the following postal address on or before 23 April 2019.